A giraffe is a type of tall cow that lives in zoos and in Africa. It is one of my favorite animals for its awkward beauty and very nice spotted pattern. They seem like a creature that should be in the prehistoric section of biology books, but hey! It’s still alive! For now at least — leave them alone, hunters and poachers! Because giraffes are a type of mammal, they give birth to live young. This is gross, but I accept that it is a necessity. Many animals give birth to helpless things that must be tenderly cared for in a nest or burrow, but giraffes, being a prey animal like antelopes and horses, I guess, have babies that are able to lope along within an hour or two. Most baby animals are widely regarded as being the cutest form of that creature, the exception being ferrets, which go from tiny cute and become a slightly larger cute. Baby giraffes are not cute at all, except in that gawky, pitiful way. The baby giraffe starts life by plummeting six feet to the ground because pregnant giraffes do not have the time or the energy to lie down. However, they make up for this by displaying sweet maternal care for wonderful photo ops later, which we all get to enjoy on the internet image searches. Aww, so sweet. It’s especially sweet because most baby giraffes have faces that only mothers could love. Really, from straight-on, they look a lot like extra-dorky E.T. the extraterrestrial. A page out of the giraffe middle school yearbook. What is it about a giraffe that causes it to start life as a nerd? Do giraffes value book smarts? I can’t be sure that adult giraffes have outgrown this phase. They don’t ALL become basketball players. I imagine that they are the animal kingdom’s telescope, and they study the stars. But they are animals, so can’t be TOO smart. They probably have a lot of astrology and maybe publish an almanac filled with superstition and omens to look out for. Like, they wouldn’t be meteorologists, they would just be like, “my head is wet so it’s going to rain soon,” and the dumb animals at ground level are impressed. Probably. In giraffe school, are the good-looking, socially-skilled kids considered to be outcasts? Are what we would think of as “popular” traits — athletically inclined, charming, or “cool” with an easy time of it — are THOSE giraffes shunned? I know they exist because I have seen a few in my searches. 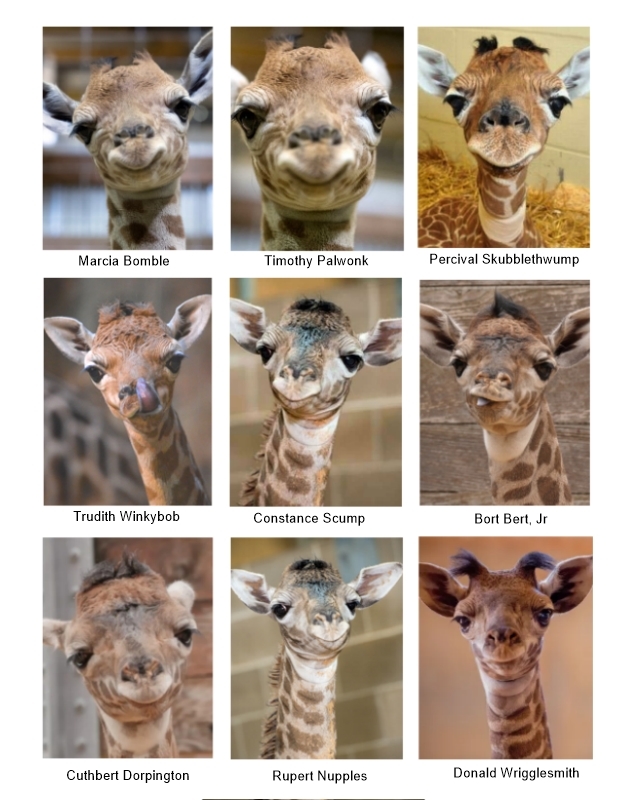 I guess I am going to end this article with the huge discovery that there ARE some non-dorky baby giraffes. Every other thing I think of makes me sound like I’m lecturing nerds to be kind to coolguys, as if it’s my business how anyone leads a life. Who am I to criticize a giraffe society that might only exist in my imagination? Ignore the fact that actually I am exactly that kind of person.